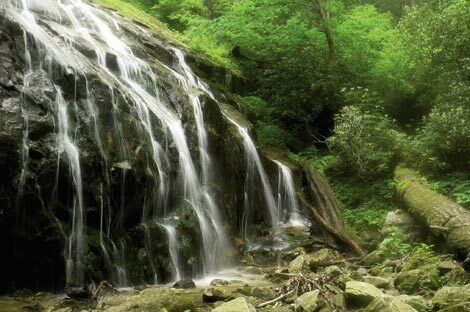 This trail features gushing waterfalls amid a craggy, virgin forest-filled chasm, and the bonus is it’s within a short walk of Blowing Rock. From the trailhead at Annie Cannon Gardens, the path starts out level. The stone structure you pass on the first switchback at less than a half mile is a relic of one of the first modern sewage treatment plants in the mountains, built in the 1920s. From here, it’s a downhill across and then along New Year’s Creek. You’ll descend stone steps past the cooling Cascades Waterfall. Turn right at 1.2 miles where Glen Burney Falls dances down a slippery, shimmering slab just below an observation deck. Take a right down the next switchback to a sign, then another right to the often rainbow-draped base of the falls. A left at that sign leads to the final cataract of Glen Marie Falls at 1.6 miles. Make the most of your time here, because what goes down must hike up. The return climb is what makes this 3.4-mile round-trip strenuous. But don’t fret; rewards await at the end. Bistro Roca, just 100 yards from the trailhead, is a great place to grab a drink and refuel. Navigate: From downtown, head south on Main Street, turn right onto Laurel Lane. After the stop sign, turn left into the parking lot at Annie Cannon Gardens.